in random moments i've slowly been working on the picnic quilt that i briefly mentioned a few posts ago. it's made entirely of vintage sheeting and pillowcase material and i'm going to use a thrifted wool blanket as the batting so it will be a bit water resistant, perfect for sitting on the grass if it's slightly damp. i wanted to use up some of my vintage stash plus make a quilt that i won't mind spilling on and this seems like the perfect solution. sewing with sleep deprivation comes with it's consequences though, i don't want to tell you how many times i've had to unpick entire rows after i've sewn them on the wrong side... or the fact that i screwed up the very simple pattern and only noticed i had the wrong squares in place after it was sewn to another row and i couldn't be bothered fixing it. good thing it's just for acquiring grass stains and eating potato salad! Oh Leslie it looks wonderful. This is gorgeous Leslie, good on you for working sleep deprived. I'm sure I have some of these sheets! Sounds like a good old-fashioned case of mommybrain to me :-) though I think it's looking awfully pretty. Would you believe that I FINALLY got your package to the post office today? Though my own mommybrain forgot to enclose the card, so I'll be sending that separately. Anyway, you should receive it in a week or so, before you head off for your holiday. Leslie, it looks lovely! 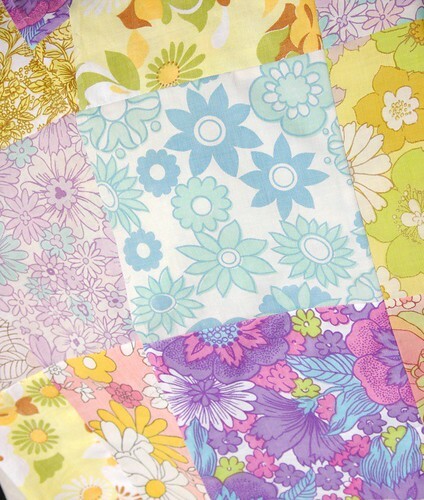 I have been trying to make a picnic quilt too, but I hadn't thought about using a vintage blanket. Love the prints! It looks like a perfect potato salad quilt. I made a throw out of vintage sheets but I didn't think of using a wool blanket (I only have about 15 of them lying around!) so it gets very soggy. Perhaps I'll sew a blanket on the back...thanks for the inspiration! It looks gorgeous - love those blue flowers! It still looks lovely - mistakes and all!